A beautiful and fully interactive photo booth experience like no other. Life sized Hungry Hungry Hippo, and you’re the hippo. Now you can be the next American Ninja Warrior. Leap and bound your way across this unique obstacle course. Two rodeo bulls. Two cowboys or cowgirls. One controller to rule them all. This is an awesome twist on a classic competition. You spin me right round…and upside down…and then again and again. The Gyro Extreme is a piece of amusement engineering genius. The best part is that is can be at your festival, and it can even fit indoors. Oh yeah! An inflatable bounce rental is supposed to be fun. Don't let renting a bounce house, inflated slide, or obstacle course deflate your party. Ohio, West Virginia, and Pennsylvania all require that a trained operator watch a ride at all times. They also mandate that all posted rules and regulations are followed and enforced by that attendant. What a pain. That's why Kurt James Fun and Games offers it's Better-Than Inflatable Bounce Rental Service. Rather than putting you on the hook for rider safety, we deliver the inflatable ride, set it up, tear it down, and operate it. 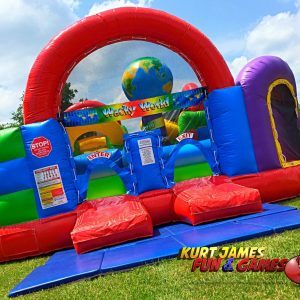 You need only enjoy watching your guests and children having fun jumping on the moon bounce, or other fun and exciting inflated or mechanical amusement rides offered by Kurt James Fun & Games. In an industry like ours companies live or die buy the customer experience. One of the reasons that we've remained a top provider for over twenty years is that we recognized early on that we aren't in the inflatable bounce rental business, but the customer service industry. Anyone with some money in the bank, or a decent line of credit can purchase a ride and rent it to someone else. However, not everyone makes you feel as if you are part of the family. Not every company will treat your event as though it is their own. We do, and it's why we've been around for so long. As we stated earlier, we are not an inflatable bounce rental company, but a full service amusement ride and game provider. There are numerous regulations in place in states like Ohio, Pennsylvania, and West Virginia to help ensure the safety of amusement ride riders. Inflatable rides fall under the same umbrella and must adhere to the same standards. Including but not limited to having trained ride operators supervising the ride and enforcing the rules at all times. Failure to do so can result in heavy fines and even jail time. When you rent a bounce house for a party or other event, the rental company will have you sign a form stating that you have been fully trained as an operator and assume all responsibility for any injuries or liabilities. Ouch! We say, forget that. Just give us a call and we'll handle it all. Ohio, Pennsylvania, and West Virginia, as well as numerous other states in The Union require that any company that owns, operates, or rents any type of amusement ride annually have each of their rides inspected and certified by a state licensed inspector. Pennsylvania actually requires that each company have at least one representative of that company certified as a Pennsylvania inspector. If you should hire an inflatable bounce house company that has not had the rides that you've rented certified by the state in which your event is being held, and they get caught (which happens with surprising frequency)' the State will fine them and immediately shut them down. We've been contacted numerous times at the last minute to see if we were available to fill in for a company that's been shut down. But wait, there's more. Let's say that they aren't caught and, God forbid, someone is injured. Assuming that the bounce house company is fully insured, the insurance company can try to use this as a way to refuse to cover the incident. Well if the insurance company won't pay, guess who the injured party's attorney is going to look towards next. It might be you. Also, should the injured party sue, their lawyer can use your lack of due diligence as a point of contention to level a suit on you. Don't put yourself through this. Kurt James Fun and Games has, does, and will always run completely above board. Every year we pay thousands of dollars to have Ohio and West Virginia inspect and certify our rides, and our son is a State Certified Pennsylvania Ride Inspector who inspects and certifies our equipment on every job (per PA regulations). Insurance is an absolute must. Less reputable inflatable bounce rental companies have been known to purchase insurance and then to let it lapse so that they do not have to pay the considerable monthly payments but still have legitimate looking documentation to provide their clients. If in doubt, contact the insurance company directly to find out for certain. Kurt James Fun and Games is fully insured. Quite frankly, it's peace of mind. Sure you can run a bounce house yourself, but do you want to? Is it worth the hassle to save a couple of dollars? Is it worth putting your guests' children at risk? We don't think so. So give us a call today to see how we can keep everyone safe while letting you relax. A fun and memorable experience is on the horizon. Say hello to our very own original live game show, and boy did we get it right. Super fast paced and perfect for education and training exercises, family picnics, and so much more, On The Spot can be tailored to fit just about any need that you might have. Hosted by a professional game show host with buzzers, lights, big screen display, and professional audio visual equipment, your guests, employees, or students will get to feel what it's like to be on a real television game show while creating memories that will last a lifetime. Learn more about how it's played at our dedicated game show website. Click Here. Smartphone Trivia is a live hosted multimedia game show that everyone can play because it supports up to 32 teams of nearly any size. If you are looking for fun activities for team building, or a regular team builder, give this a try. To learn more, check out our game show division website and Click Here. Just just like the hit Nickelodeon game show, Double Dare, from the 90's, I Double Dare You combines trivia questions with physical challenges. This is one of our most popular Game Shows.